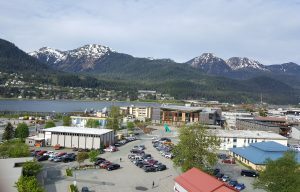 There is no shortage of amazing views in and around Juneau. 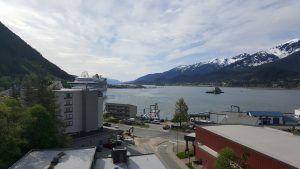 Tucked away in the State Office Building, 333 Willoughby Ave, The SOB Observation Deck offers a surprisingly amazing vantage point to take in a breathtaking view of Gastineau Channel and Douglas Island. 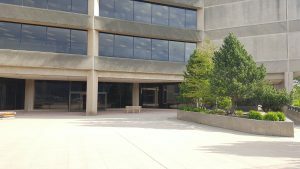 The Observation Deck is located on the eighth floor and is open to the public. 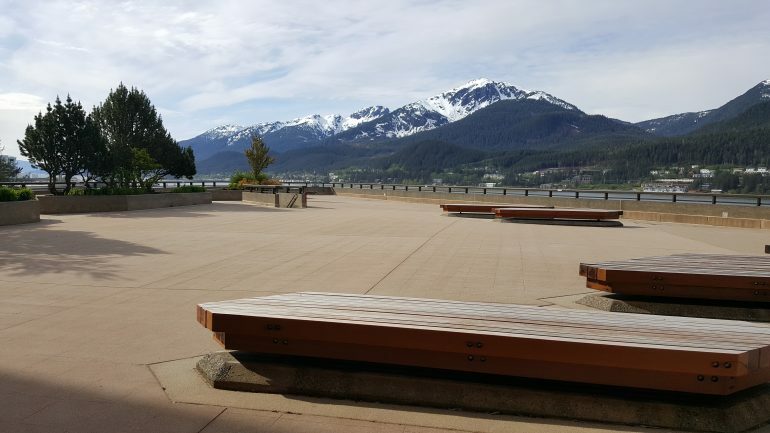 There are plenty of benches with wide open space and it is a great place to take a break and take it all in. It even provides a wonderful spot to eat a packed lunch. You never know what you will see: ships, planes, whales, orcas. If you go on Friday at lunch you can even hear the Kimbal Organ playing. However, because it is a wide open space, and it often rains in this temperate rain forest, be prepared! Your only cover may be the raincoat you remember to bring! Just don’t let the weather keep you from enjoying this lovely view.